As he drove around a Florida City neighborhood Tuesday, police officer Marcus Terry noticed that a car door had been left open in the driveway of a house. He knocked on the front door to alert the residents. 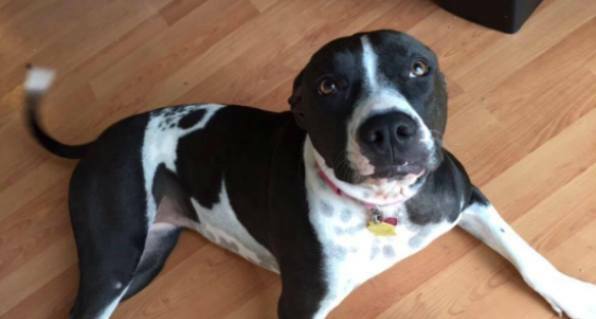 When Sage Raphael opened the door, her family’s rescued 2-year-old Pit Bull mix, Duchess, bolted out. As Raphael watched in horror, Terry quickly pulled out his gun and shot Duchess three times in the head. “I was about to grab her. I had her and two seconds later, it’s three gunshots,” Raphael told CBS Miami. “Your dog charged me,” Terry told her and her mom, who ran out when she heard the gunshots, Local 10 News reports. He said Animal Services would pick up Duchess, and then walked away, leaving the dog lying in a pool of blood. A surveillance camera captured the horrible incident on video. Duchess doesn’t appear to be showing any signs of aggression in the second or two before Terry killed her. Officer Ken Armenteros, a spokesman for the Florida City Police Department, told Local 10 News that facts about the shooting are currently being gathered. Terry has been placed on administrative leave during the investigation. An online petition asking that Terry be fired has more than 22,400 signatures as of Thursday morning. Sadly, some police officers tend to be gun happy when dealing with pet dogs who are just doing what comes naturally — protecting their families and property. Across the country, far too many dogs have been shot and killed by police officers who have had no training in how to deal with them. According to Ozymandias Media, which produced the new documentary “Of Dogs and Men” on the topic, a dog is shot by law enforcement every 98 minutes. In 2013, Colorado became the first state to pass a “Dog Protection Act,” which requires all law enforcement officers to undergo training in dealing with dogs. In May, Texas enacted a law that requires a statewide comprehensive training program in dog encounters to be created by Jan. 1, 2016. This is a start, but as Duchess and these sad statistics make clear, teaching law enforcement officers how to humanely deal with dogs should be required in every state. Officers who choose to treat dogs inhumanely should be charged with animal cruelty. Here’s the surveillance video showing Duchess being killed by Terry. Please be warned it is very graphic and disturbing. My heart goes out to Palacios and Raphael. Rest in peace, Duchess.